I attended a conference last week where I had the privilege of hearing Nancy Guthrie speak to a group of women for two breakout sessions. I was familiar with a couple of Nancy's books prior to the conference, but I had no idea how many books she had written or that a major theme in her writing is seeing God in the midst of suffering. In the second session, Nancy shared some excellent advice and insight about relating to a friend who is suffering. I basically cried through the session. So much of what she said took me back to this time six years ago as I watched my friends grieve the loss of their 5-year-old daughter. I wrote about Lindsey earlier this year on her birthday in April. Today marks 6 years since her death. While Lindsey's birthday is a bittersweet day, it is at least a time for celebrating her birth and life. I feel for my friends who miss the daughter they can't celebrate in person on that day, but I rejoice with them over the fact that Lindsey was born and that she lived for five years. But November 7 is more of just the bitter side of things, as it is a day filled with agonizing memories. On this day, I just try to say "I miss Lindsey, and I haven't forgotten." "There are some things worth crying about, some people worth a great sorrow." Worth a great sorrow. Of course there will be tears, lots of them--and for a long time! The life that was lost is worth all of the sorrow. There should be grief. Nancy did reference the joy that Christians can have in knowing that their loved one is in God's presence--she said, "The presence of God is not tragic." So true! But she encouraged Christian friends not to be too quick to put that balm of healing on an open, gaping wound. Instead, she said, make room for the tears and sadness. The day after Lindsey died, I went to my friend Laura's house to bring a small gift to Lindsey's little sister Cadence (age 3 at the time). The movie Cars had just come out on DVD, and I had been thinking about giving that to Lindsey and Cadence because we had seen that movie together as families just a few months prior. That day Caroline and I stopped by to drop it off and check on Cadence. When we got to the house, Jason and Laura weren't there (they were out making burial and funeral arrangements with the help of a family member), but Cadence was upstairs playing with her cousins. The house was full of friends and family members, many from out-of-town. One friend had me write my name down on a sheet of paper where she was starting to keep track of visitors, and as I looked at that sheet and looked around at the rooms full of sisters and friends taking care of things for Laura, I lost it emotionally. I was standing there with people who were even more closely touched by Lindsey's death than I was, and I felt terrible for coming over to cry in front of them. I felt like I should get it together before Cadence came downstairs, but I couldn't. I said, "I'm so sorry, I just can't help it!" And Laura's friend--who had welcomed me into the kitchen cheerfully and graciously, but who had no doubt cried her own share of tears that morning--said warmly, "Goodness--if we can't cry about this, then what can we cry about?" Those words have gone over and over in my mind ever since. I think she was saying something very similar to what Nancy said. Of course we will cry. The reality is that even though we do not grieve as though we have no hope (1 Thessalonians 4:13-14), losing someone is sorrowful. And they are worth the tears. 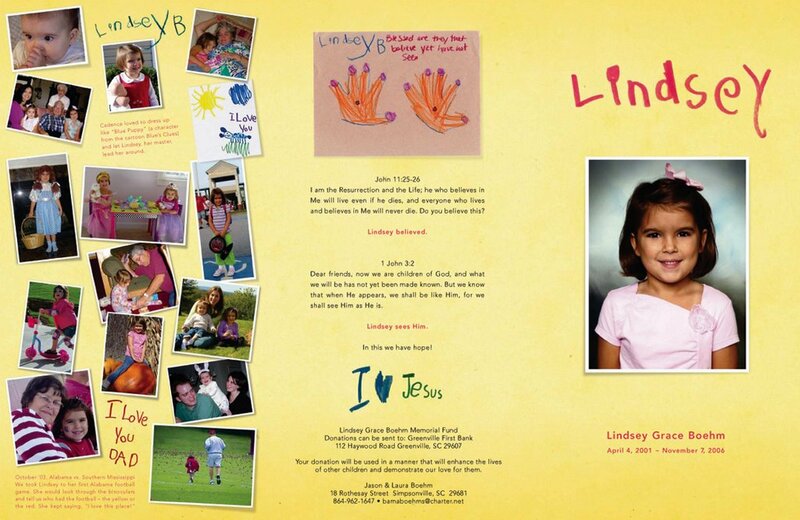 Today, as I think about Lindsey and her sweet family, I will let the tears come as they may and see them as a testament to the fact that Lindsey was a very, very special girl with a meaningful life and that her loss was profound. And I don't think that needs to be apologized for or given a disclaimer. I feel like I understand this better today than ever before. 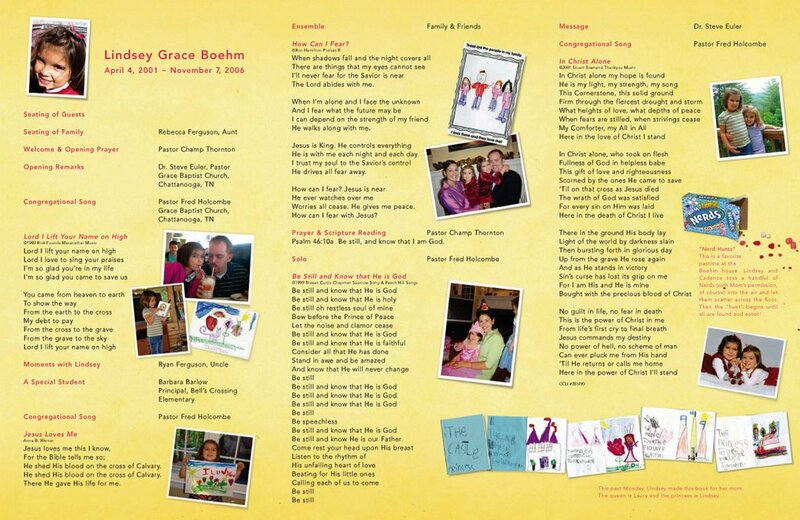 We love and miss you, Lindsey Grace Boehm. If you want to read more about Lindsey, you might like looking over this and this (the funeral program that a very talented friend made). You can read a few words from Laura from November 2006 on her blog as well. Wonderful post! Thank you! Just last week I started reading Nancy Guthrie's book "Be Still My Soul". Her books are such a blessing. I would love to hear her at a conference some day. I really want to read Be Still My Soul--just today I received Hearing Jesus Speak into Your Sorrow and Come, Thou Long-Expected Jesus (a collection of writings on Christmas/Advent). Yes, you would love hearing her in person . . . I will let you know if the audio from the sessions I attended becomes available online! Yes, we are definitely on the same track! And since nothing happens by "luck or happenstance", there is some reason that we are on the same track. :o) The reason may not even be clear this side of eternity. I read Come, Thou Long-Expected Jesus and Jesus, Keep Me Near the Cross (Easter essays) two or three years ago. I have also read O Love That Will Not Let Me Go:Facing Death with Courageous Confidence in God. In fact, I highly recommend giving O Love That Will Not Let Me Go as a "sympathy gift" to those who are grieving the death of a loved one who is now with their Saviour. I gave my copy of the book to a friend whose dearly loved father-in-law died earlier this year. I need to get another copy to keep in my library. Rick, thank you so much for your kind words. That WILL be quite a day! It's so nice to hear from you.